See these Lake Tahoe attractions on your next California vacation. This popular winter ski area is also a popular summer vacation destination, with many outdoor activities. Lake Tahoe is located in northern California, in the Sierra Nevada mountains. This beautiful lake is a popular vacation destination in California, offering fun outdoor activities all year. Most of the lake in located in California, but it also borders the state of Nevada, where gambling is popular in Reno, NV. North Lake Tahoe California offers some of the best winter Lake Tahoe ski areas, and the best outdoor activities such as hiking, mountain biking and river rafting. The crowds are thinner in this area, and nearby Donner Lake. South Shore Lake Tahoe is more developed and closer to the Nevada casinos at Stateline, since the lake is conveniently located about 70% in California and 30% in Nevada, where gambling is legal. So if you want to try both skiing or summer activities and gambling on your vacation, then your best bet is to stay in South Lake Tahoe CA so you are close to the casinos. Beaches – Lake Tahoe offers 30 beaches around the lake, which are fun to explore or relax in the sun. A few brave swimmers go in the water, but it is quite cold. If you want to swim, we suggest you try Donner Lake located west of Truckee, as it offers warmer water and two nice beaches. Camping - There are many Lake Tahoe campgrounds for tent and RV camping around the area, including some located right at Lake Tahoe or nearby Donner Lake. Camping makes both a fun and affordable vacation in the beautiful backdrop of the lake and surrounding mountains. Casinos in South Lake Tahoe – If you feel lucky and like to gamble, then you’ll want to try the Lake Tahoe casinos such as Harrahs or Harveys South Lake Tahoe casinos. Castles and Mansions - Visit Vikingsholm Castle or Tallac Historic Estates for some interesting architecture and glimpse of history. The hike to Vikingsholm is 1 mile up and down a steep hill, but it is an easy stroll to the Baldwin estate, Pope Estate and Valhalla historic sites as part of the Tallac Historic Estates. Both are located along the western side of Lake Tahoe basin and offer beautiful views of the lake and surrounding mountains. 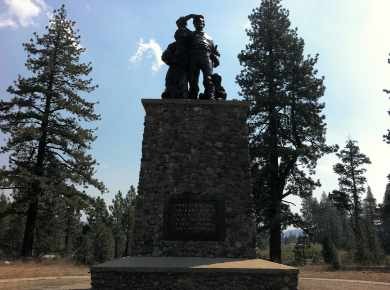 Donner Memorial State Park and Donner Lake – Visit the nearby Donner Memorial State Park in honor of the ill-fated Donner party, a wagon train in 1846 who got caught in an early snowstorm as they tried to cross the Sierra mountains in California. Nearby the monument is Donner Lake, a popular vacation spot. You can rent kayaks, stand-up paddle boards, jet skis and more for a reasonable price and explore the lake. Hiking – Lake Tahoe area offers outstanding hiking trails in the area, including easy to advanced hikes along the lake or nearby Truckee river or Donner lake. For suggestions on some popular trails, see Lake Tahoe hiking trails. Hiking is one of the best Lake Tahoe attractions. Kayaking – It is hard to resist going out on the lake, and I think kayaking Lake Tahoe is a fun way to explore Lake Tahoe or nearby Donner Lake. You can rent kayaks in several locations. For kayaking Lake Tahoe, you can rent kayaks in many communities around the lake. Lake Towns - Explore some of the small towns surrounding the lake. We like Tahoe City and Kings Beach along the north shore. If you are craving some ice cream, try Poppys Frozen Desserts in Tahoe City at 521 N Lake Blvd. For a burger, try The Char-Pit at 8732 N Lake Blvd in Kings Beach. Bike trail along the Truckee River near Lake Tahoe Calif.
Mountain Biking – There are many bike trails all around the Lake Tahoe area, including stretches along the lake, the Truckee river, and nearby Tahoe Donner. 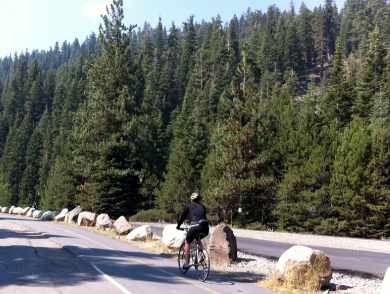 For more adventure, try mountain biking at NorthStar or along portions of the Tahoe Rim Trail. River Rafting – On the west side of Lake Tahoe California lies the beautiful Truckee river. You can enjoy a leisurely float down the river from Tahoe City for 5 miles to River Ranch pond. Bring your own raft or rent a raft from Truckee River Rafting at 888.584.7238. There are coupons to save $5 off per person. Skiing - Lake Tahoe ski resorts are the premier skiing location in California, for both downhill skiing and cross-country skiing. Many Lake Tahoe Ski Resorts also offer other activities for non-skiers such as ice skating and snow play. 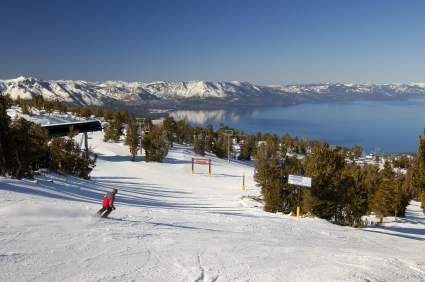 Skiing is one of the top Lake Tahoe attractions during the winter months. Squaw Valley – Home to the 1960 Winter Olympics, Squaw Valley resort has world-class winter skiing but is worth a visit anytime. During the summer you can take the tram ride to the top and enjoy the many hiking trails, swimming pool, Jacuzzi, bungee jumping, rock climbing, roller skating, mountain biking, or just the spectacular views. There is a cafe near the pool that offers drinks and an interesting menu with appetizers, salads, sandwiches and burgers. During the winter they have an ice skating rink at the top. This is one of the best Lake Tahoe attractions. Check out Groupon Reno for discounts such as 2 for 1 tram ride tickets. A great deal! Virginia City - If you are visiting the Lake Tahoe area for several days and want to explore a western town, try a day trip to Virginia City, Nevada. The old mining town offers something for everyone - Ponderosa mine tour, old-fashioned train ride, museums, saloons, candy stores, restaurants, shops and historic buildings. Stop by the Virginia City Visitors Center for discount tickets and packages for some attractions. They can also recommend restaurants. Virginia City is located about one hour east of Lake Tahoe so plan to allow 1/2 day or all day to visit. Water Sports – Summer water sports including fishing boats, canoes, kayaks, pedal boats, ski board, jet skis, waverunners, sail boats, water trikes, sailboats, windsurfers and more. Rentals are available from the Lake Tahoe marinas around the lake, or at nearby Donner Lake. Lake Tahoe is a popular California vacation destination all year. Lake Tahoe attractions include great water sports in the summer, miles of hiking trails, and world-class ski resorts in the winter. The north shore of lake Tahoe area can be accessed from interstate highway 80, while you can reach south shore lake Tahoe from highway 50. During the winter months, chains may be required due to heavy snow, and occasionally the roads are closed in a severe storm. On the eastern side of the Sierras, highway 395 is another route to Lake Tahoe. 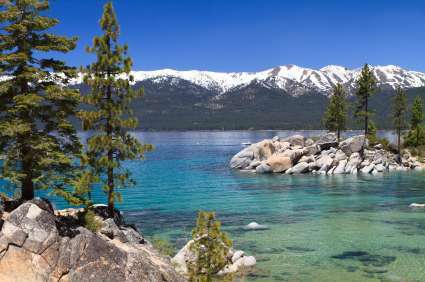 Lake Tahoe is a popular California vacation spot for those living in the San Francisco Bay Area, and is one of the best California vacation destinations for visitors to California from around the world. From San Diego or Los Angeles areas in southern California, it is easy to get a quick flight to Reno international airport, just 30 minutes drive from Tahoe.